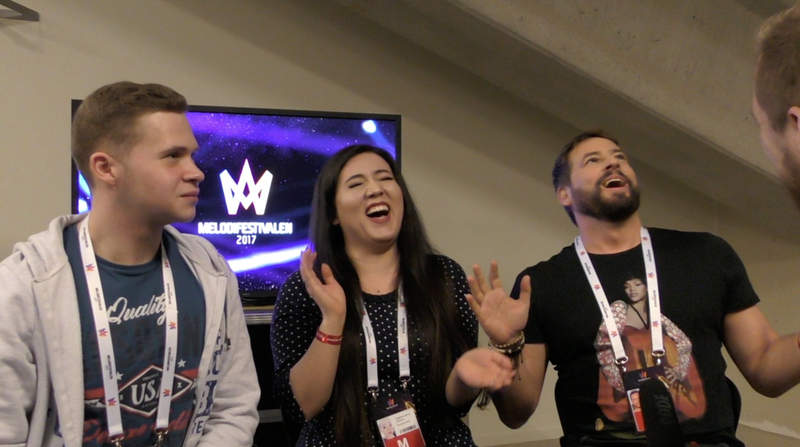 Giovanni sat down with Marc Gehring, Jenevia Kagawa Darcy and Pavlo Hrosul to discuss tonights show, the F-word debate and who they think will win Melodifestivalen 2017. What does Jenevia think about Robins crotch-shot being gone? and how will the international jury affect tonights results? Giovanni satte sig ner med Marc Gehring, Jenevia Kagawa Darcy och Pavlo Hrosul för att diskutera kvällens show, F-ordsdebatten och vem de tror kommer att vinna Melodifestivalen 2017. Vad tycker Jenevia om att Robins skrevklipp är borta? och hur kommer intenationella juryn att påverka kvällens resultat? Youtuber, blogger and all-round social media guru. Watch more from her on Youtube – click here! Marc is a writer for the German ESC blog PRINZ.